Notes: The castle has no dedicated parking itself but local town centre parking is readily available (pay and display) and only a few minutes from the castle itself. Impressive ruins of a motte and bailey castle including some portions of the curtain wall. The shell keep remains in it’s entirety and the circular tower within allows visitors impressive views over the surrounding area. Castle is managed by English Heritage. 1. George Fox, founder of the the Quakers, was held at Launceston in 1656 for distributing religious pamphlets in the town. Built at the fording point between Cornwall and England, Launceston Castle was built soon after the Norman conquest and in the subsequent years served as an administrative centre for the Earls of Cornwall and a country prison long after its military function ceased to be relevant. 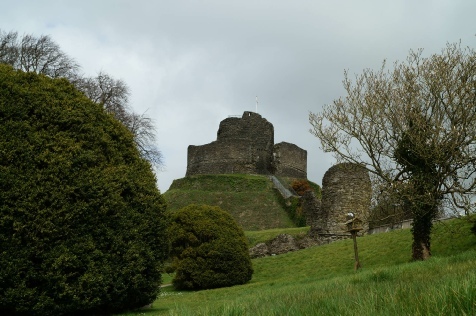 The first historical reference to a castle at Launceston is found in the Domesday book in 1086 but it is almost certain that the first castle, a traditional earth and timber motte-and-bailey, was built here earlier. Situated at the main fording point into Cornwall the Normans would fully have appreciated the strategic value of the site and it was likely the castle was established during their expedition of 1067-8 to suppress a South-Western rebellion centred on Exeter. Late in the twelfth century the castle underwent significant modifications. The earth motte was enlarged and the wooden palisade replaced with the current circular shell stone Keep (the outer wall). The outer gatehouses were also rebuilt in stone. Further modifications occurred in the thirteenth century as the new owner, Richard of Cornwall, added the central round tower within the shell keep, modified the gatehouses and rebuilt the perimeter wall in stone. Although designed and built to dominate and control the fording point into Cornwall, Launceston also acted as the administrative centre for the Earldom of Cornwall. In 1272 these were transferred further west to Restormel Castle near Lostwithiel although delivery of justice remained at Launceston until the early seventeenth century. The last engagement in national politics for the castle was during the Civil War (War of Three Kingdoms). The castle and town were held for the king until 1646 when General Fairfax took both as part of his pursuit of the Royalists into the far South West. Thereafter the grounds of the castle continued to be used as a prison until 1842.